The 2004 growing season got off to an early start as the winter rains ended in March and bud-break occurred earlier than normal. The summer was reasonably consistent, but some heat spikes in September had winemakers scrambling a bit. 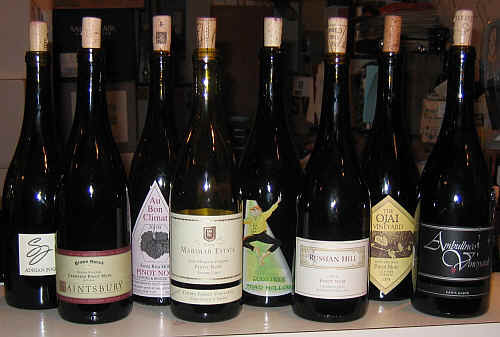 We assembled a set of 8 wines, all but one from the 2004 vintage. The exception was a bottling we've had in previous vintages that routinely gets great reviews from The Wine Advocate journal. Our experience with this wine has been consistent and different from Mr. Parker's tasting notes. When a bottle became available, we were eager to see if we'd change our opinion of this vintner's wine. One wine easily outpaced the pack, finishing in first place by a wide margin despite having two last place votes! All but one wine received at least one first place tally. 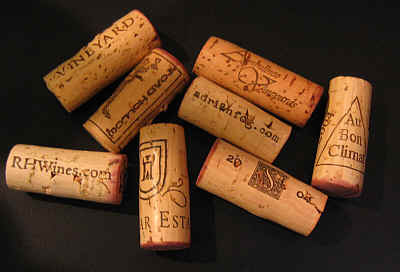 Here's a selection which routinely gets great reviews from Robert Parker of The Wine Advocate. This vintage saw half the tasters rank this as a last place wine. One critic encountered "Notes of apple cider. It's a bad wine, with ripe elements and sour notes. It's quite bitter. Yuck! Something went wrong here." Someone else characterized the wine as reminiscent of "pomegranate juice." 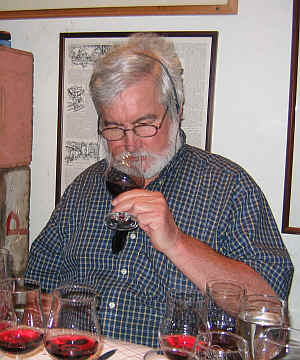 Another person found "Sweet and sour notes in this Port-like, over-ripe, Late Harvest Zin-sort of wine." I found the appearance to be dull, rather than brilliantly clear. The nose shows touches of ripe berry fruit with a leathery fragrance lurking in the back. I found a touch of brown spice and then it took on a more rustic element. I, too, encountered an appley character which detracted from the wine. This has earthy flavors and is a bit hot, with mouth-drying tannins. Some people may appreciate the rusticity, but our group did not. "The fruit profile ranges from blue to black, with layered essence of earth, truffles and spice. She's a powerhouse with oak trim on a firm stone foundation. Aged in new and seasoned French white oak barrels for 11 months. Bottled unfined and unfiltered with loving care." As the French say, "Chaque un a son gout." "There's not much flavor here." announced one critic. Someone else characterized the Saintsbury as having a "fake cherry aroma, resembling Kool-Aid and having, perhaps, a bit of sweetness, high alcohol and it's bitter and astringent." Bob Gorman described this as "soda pop simple. Add some sparkling water." A final voice lamented that "this has nothing in the glass." I found Saintsbury's Brown Ranch to be of a light garnet color and it shows lots of cherry notes, from fresh cherry fruit to kirsch eau-de-vie to cherry pie. There's a whiff of a brown spice component on the nose, too. I found nice Pinot character here, even if it is a shade on the simple and easy side of the spectrum. The $60 price tag is mighty ambitious. I think the wine can be cellared for a few more years. I'm giving it a one star+ rating. Someone described the Au Bon Climat wine as having "a decidedly Burgundian 'stink' as it shows smoked meat notes, roasted chestnuts and some dried and bitter tannins." Echoing this was one panel member who found it "chalky and thin." Another critic knocked it for having a "short finish." More positive was someone who found "spice box and cherry notes. It shows sweet fruit on the front of the palate, but it has a sour finish." Another taster wondered if they had to adjust the acidity here, finding it a bit awkward. The color of the ABC Pinot was correctly garnet in hue and intensity. The nose displays mild cherry notes and a slight spice tone. 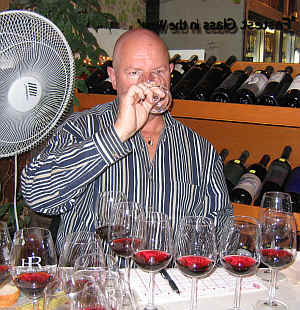 The wine is medium-bodied and nicely proportioned. It's all "correct," but the wine seemed a bit quiet and closed on the palate. The cherry fruit is there, but it doesn't seem as though it's opened at this stage, so perhaps time will bring this to a level of great interest. I'm giving it a one star rating presently. It seems to have a bit of structure to warrant 5 to 8 years of cellaring, so I suspect it will be better with time. 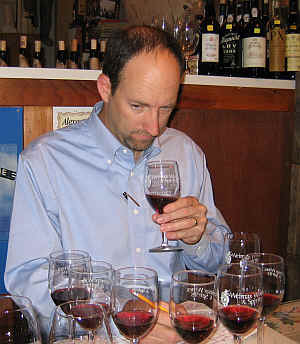 One panel member was bothered by the alcohol of this wine, while a second taster said it was "way too astringent and bitter. It's rather ugly." Another critic found "smoky and meaty notes with hints of forest floor. It's also rather astringent." More enthusiastically, one person described the Marimar Pinot as showing "a Burgundian nose with earthy notes and some dark cherry fruit, but it's sharp and clipped on the palate thanks to elevated acidity. Maybe a bit of time will resolve the negatives here?" I noted medium+ garnet color and a nice, woodsy aspect to the nose. There's a nice bit of oak and vanillin, with some Oriental spice notes. I felt this was a really good rendition of "California Pinot Noir," as it tips its cap towards Burgundy, but retains its roots in California. Medium+ bodied, it's a bit tannic and warm. There are some beet root flavors and nice fruit. I'm guessing this will last nicely for 5 to 8 years. One star+. "I found this a bit chocolaty," announced one taster, adding "It has a short finish, though." 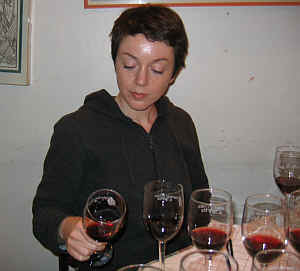 Someone else found "a little bit of oak on the nose and nice, sweet fruit and good balance." Another fan said it has "wonderful flavors with sweet cherry fruit, some cinnamon spice and vanilla, but it's a bit closed. I also detected some forest-floor notes. Perhaps time will allow this to blossom more fully." One critic found "good spice notes on the nose and bright cherry fruit on the entry, but it has a hot finish which takes this down." A final critic said this is "reasonably serious Pinot Noir and it's nicely balanced." Displaying light garnet color, I found plenty of cherryish fruit aromas on the nose. There's decidedly 'red' fruit fragrances here with a nice touch of wood. It seemed to open nicely over the course of the tasting. Medium-bodied. Mildly cherryish flavors are framed by a nice hint of oak. Good structure and plenty of fruit to match the mild tannins. I'm guessing this to be worthy of 5 to 8 years of cellaring. One-and-a-half stars. 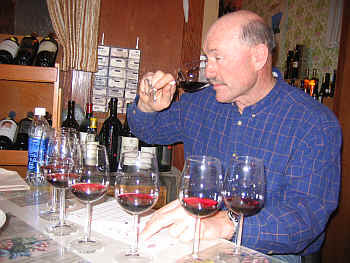 "Rod," by the way, is the late Rodney Strong who was a part of the Toad Hollow project after he sold his Rodney Strong winery. "Asparagus!" declared the first critic. Another found "Smoky notes and a bit of an herbal tone to the fruit. Good varietal character and good balance, depth and focus. This has lots of stuffing." Someone else found "Sweet berry fruit with hints of a Burgundian 'stink' and nice acidity and balance. It's a shade bitter on the finish." Echoing the funky theme of this wine, another person described the nose as "stinky and showing a hint of rhubarb. It's rich and round on the edges, but a bit weak in the middle." I found the Russian Hill wine to show a light garnet color. There's nice cherry fruit to the aroma and hints of vanilla bean tones on the nose. Medium-bodied, it's a good, solidly cherryish Pinot Noir with a streak of heat and tannin on the palate. One star. "This wine shows extremely ripe black cherry fruit and blackberry notes. It doesn't really have the color of Pinot Noir, being a bit darker. Nice blackcurrant fruit on the palate, it seems to have a bit of heat from high alcohol." said one critic. Another taster found "cherry gum-drop flavors and that's not good. It's simple, grapy Pinot Noir." 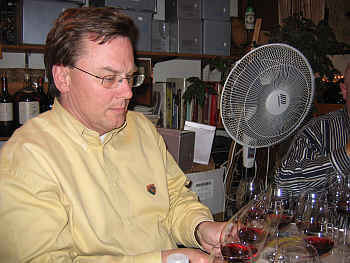 More enthusiastic was one taster who found "lots of potential to this wine. It's compact, a bit brooding in character and it's deep, needing time to evolve. It's a big wine and there's a lot going on here." I, too, found the color of the Ojai wine a bit deeper and darker than the rest of the field. The aromas were more of black fruits than red. There's blackberry and plum notes which seemed more intense than typical Pinot Noir. It's not especially Burgundian, though it is a pretty wine. The flavors also show plummy notes and aspects reminiscent of plum skins. It's less Burgundian and more "new world" in terms of its character. With 5 to 8 years+ of cellaring potential, I gave this a one-and-a-half star rating. Even with two tasters out of 14 rating this as their last place wine, the Ambullneo bottling called Canis Major ran away with the tasting. One person enthusiastically described this as "Terrific! It's got a vegetal tone and slightly sulfury at the outset, with ripe cherry fruit and good balance. There's cinnamon spice and vanilla, too. Bitter and a bit astringent, it's certainly a Burgundian-styled effort." Another person also detected the sulfur notes "along with canned veggies on the nose, but it tasted great! Cherries and plenty of varietal character." One panel member said "I liked the palate better than the nose. There are vegetal notes and plummy, herbal qualities here. It has a great, long finish." A final voice described it as "clean and zesty on the finish." I described the color as being garnet and correct for Pinot Noir. The aromas were very fine, showing some dark cherry fruit and a bit of forest floor. Nice oak and Asian spice notes on the nose. Medium-full to full-bodied, this is a big, intense, full Pinot Noir. It's a really nice, deep, showy wine. This wine features fruit from a multitude of good vineyards and nice oak, though the wood adds complexity and doesn't account for the theme of the wine. It's probably got 5 to 10 years' worth of cellaring potential, but it's might showy right now. Two stars+. Wonderful wine.